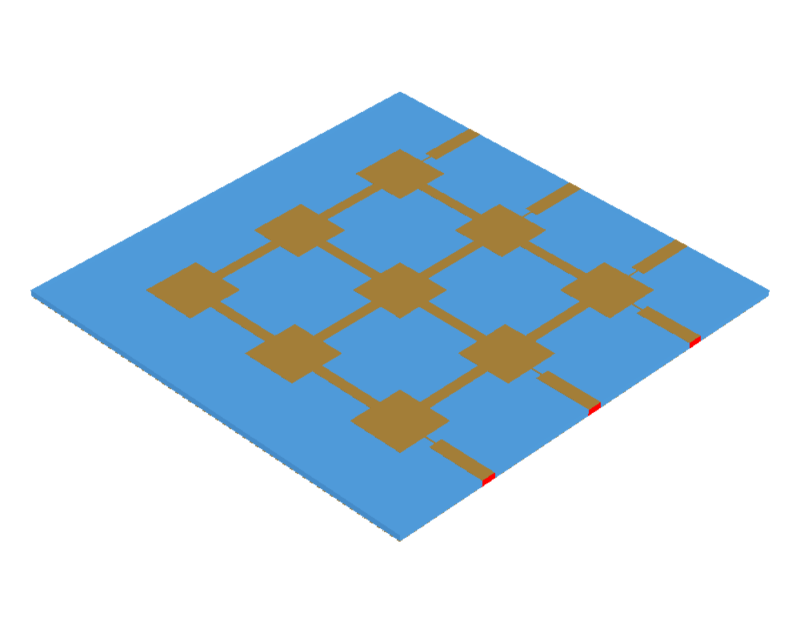 Image of the Series-fed 3 by 3 rectangular patch array. 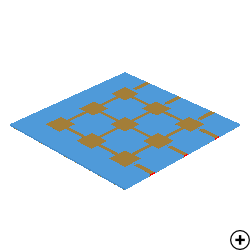 The array consists of a 3 x 3 series fed configuration of rectangular patches. By adjusting the excitation of these ports, the direction of the main beam (squint) as well as the sense of linear polarization – diagonal, vertical or horizontal - can be controlled. When all 6 ports are excited simultaneously and in phase, a symmetrical broadside lobe in the zenith direction with low sidelobe levels and diagonal linear polarisation - as shown in figure 1(a) - is achieved. By exciting the three vertical ports only, a vertical linear polarized radiation pattern can be achieved and the direction of the main beam steered left and right (in the Φ = 0° plane) as shown in figure 1(b). If a horizontal linear polarized radiation pattern which may be steered up and down (in the Φ = 90° plane) is required, only the three horizontal ports should be excited as shown in figure 1(c). The operating bandwidth of this antenna configuration is approximately 1%, as illustrated by the reflection coefficient of the three vertical ports. The agile polarization and steering capabilities of this antenna makes it well suited to dual polarized narrow-band airborne synthetic aperture radar (SAR) applications.